Heat the oven (with the oven rack in the middle) to 425°F. 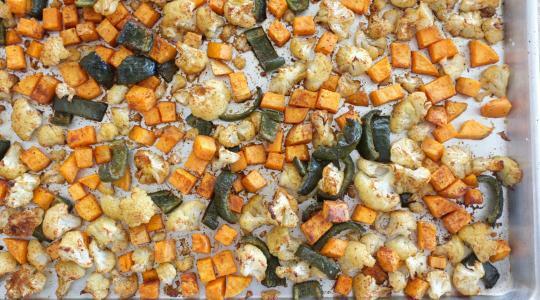 For the roasted vegetables, cut the cauliflower into very small florets and put on large rimmed sheet pan. 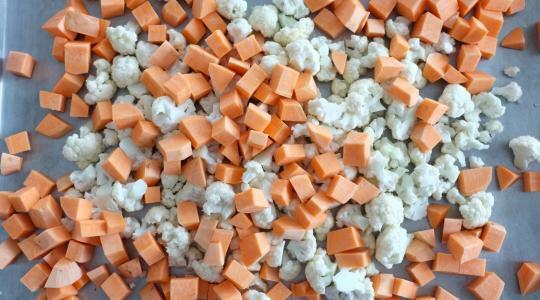 Peel the sweet potato and cut into small cubes a little smaller than ½ inch and add to the pan. 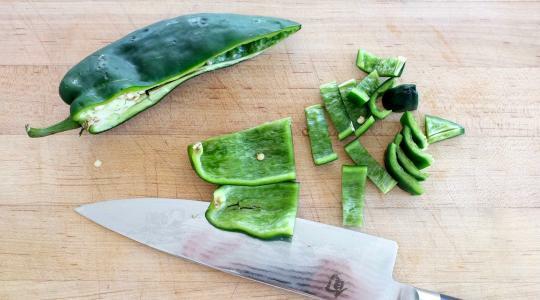 Cut the poblano in quarters lengthwise. Remove the core and seeds. Slice each half crosswise ½-inch wide slices and add to the pan. Drizzle with the oil and toss.. In a small bowl, stir together the chili powder, chipotle powder, and salt. Sprinkle over the vegetables and toss to coat. Spread into a single layer. Roast for 30 to 35 minutes, until tender and caramelized. 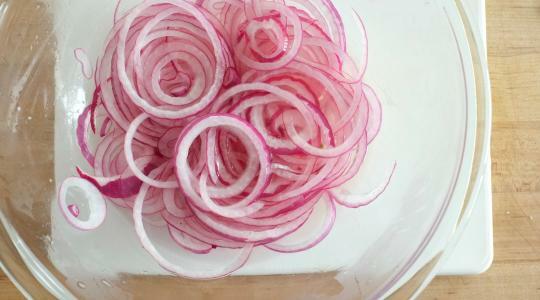 To make the pickled onion, in a small saucepan, combine the vinegar, sugar, salt, and 2 tablespoons of water over medium-high heat. Let come to a boil then stir until the sugar is dissolved, about 30 seconds. 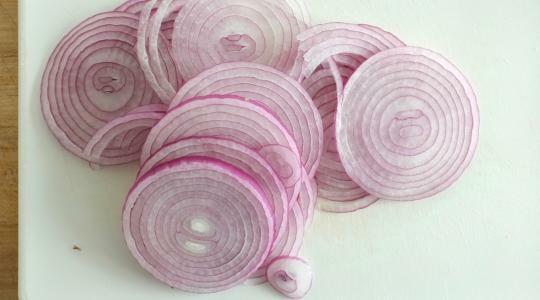 Thinly slice the onion and separate into rings. Put into a medium glass bowl, pour in the liquid and toss. Let cool to room temperature, tossing every so often, then, transfer to a container to refrigerate until ready to use (up to one week). 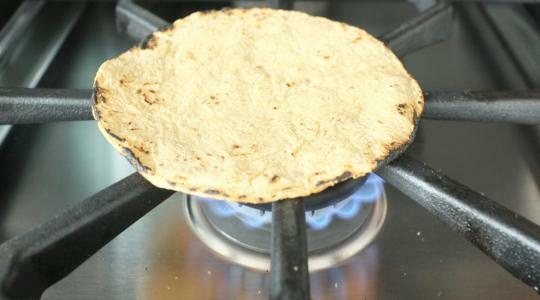 To heat the tortillas, using tongs, hold a tortilla over the flame of your stove. Flip so both sides are slightly charred but still pliable. Repeat with all of the tortillas and keep them warm in towel. 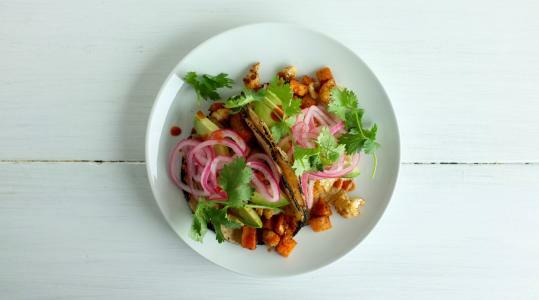 Fill the tortillas with the sweet potato-cauliflower mixture and top with avocado, cilantro, and hot sauce, if desired.